The exhibition Beginning with a Bang! From Confrontation to Intimacy proposes a movement between two artistic scenarios and is organized into two distinct sections. The first, a selection of action-based projects by artists working in Buenos Aires; the second, a documentary section exploring the rich historical foundations that link these projects to the 1960s and 1970s. A video by Pepe Lopez provides further insight into the exhibition. 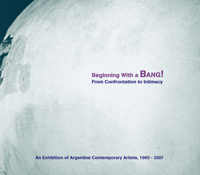 The catalogue includes essays by Ana Longoni, Victoria Noorthoorn and Daniel Quiles; manifestos by Alberto Greco; Aldo Pellegrini; Manuel Peralta Ramos and Eduardo Costa, Raul Escari and Roberto Jacoby among others, as well as a historical timeline that features the shift between the explosive and experimental moment in the Argentine art scene of the 1960s, and the current scene emerging after the extreme crises in Argentina during the last 40 years.